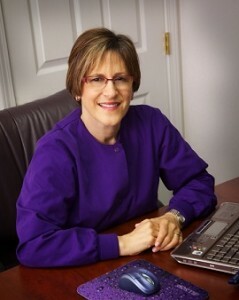 A Michigan native, Dr. Karen P. Meyers has been practicing dentistry for over thirty years. After receiving her bachelor and doctorate of dentistry degrees at the University of Michigan, Dr. Meyers spent several years in Chicago doing her year of general practice residency and then working as a dentist. Dr. Meyers returned to live and practice in Michigan, where she raised her family and has dedicated herself to her practice and patients. Dr. Meyers takes a practical approach to her patients’ oral health and care. The practice philosophy is built around a straightforward outlook that always looks for what is best for the patient in the short and long term. Patients of Dr. Meyers may rest assured that they are in the hands of a caring and experienced dentist who has their best interests in mind. When she is not busy with her practice or her family, Dr. Meyers volunteers her time at a local charity dental clinic and in her free time enjoys reading, bike riding, mah jongg, travel and sewing.